Cooking elaborate meals on weekdays is impossible for me after work. I usually do quick fixes for dinner. For that I need to plan ahead and make some dishes on the weekend or get the chopping part done so that my job gets easier on the weekdays. Roasted vegetables with a drizzle of Olive Oil and a dash of spices & herbs are welcomed by even the youngest member of my family. To be honest he prefers raw vegetables; adding spices sometimes make it too spicy for the lil guy. We have 2 extreme sets of taste buds in our household. The eldest one wants everything spicy. So its a dilemma for me to make things with a perfect balance that appeases both palates. I love the roasted version of salads. So I usually roast veggies on the weekend to pack it for lunch during the weekdays. Along with I either make the dressing ahead and kept it handy, which makes my life easier. Store bought salad dressings are easy to use. But have you noticed the ingredient list on the back of the bottle? Its hard to find the conventional brand without MSG. Otherwise you have to get the organic version of the dressing. Here is a simple guilt free salad dressing that you can use on roasted or raw salad vegetables that tastes delicious and is healthy too. You can very well adjust the quantity to make half the amount of the recipe. Add all the ingredients into the jar of a blender. Blend it for 30 seconds. Transfer to a mason jar with airtight lid and store it in the refrigerator. 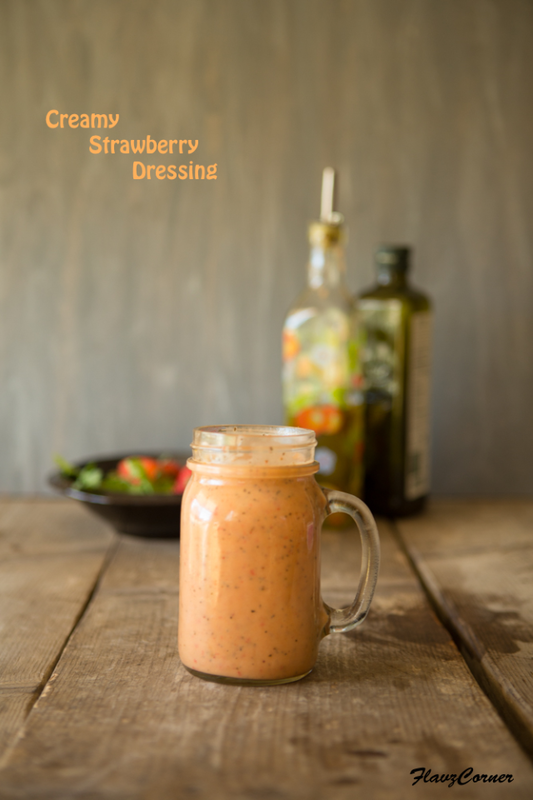 Enjoy your favorite salad with creamy strawberry dressing. The left over can be stored up to one week in the refrigerator. You can use regular vinegar instead of Apple Cider Vinegar. You can substitute regular table salt for sea salt. 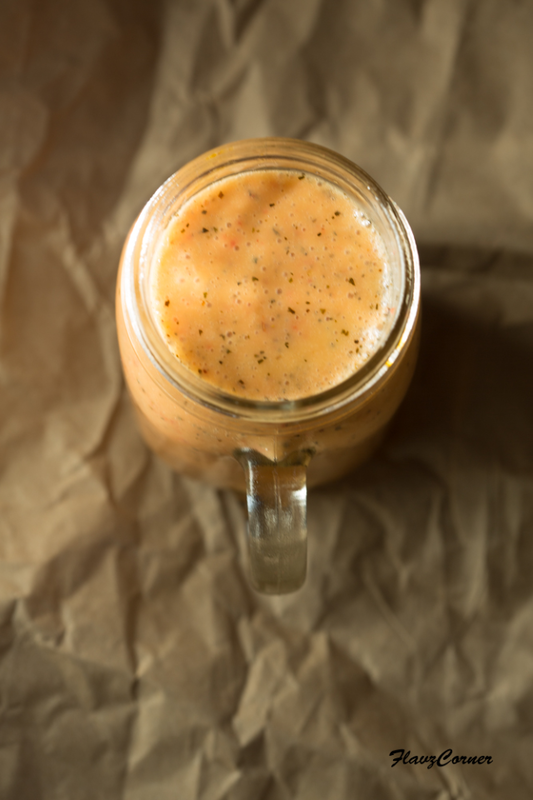 If you need to jazz up the dressing, add some pepper powder and red chili flakes to it. I've always had a tough time making good salad dressings...mayb i'm still a bit too accustomed to the taste of store-bought dressings :) I really like the color of your salad dressing. I love make fruity vinaigrette during the summer time. Your strawberry dressing looks terrific! Wow, never tried a salad dressing with strawberries. I am sure my son will like this cos he loves strawberries. But have to wait till december to get hold of them! It's a really good idea to make a batch of salad dressing and store it! 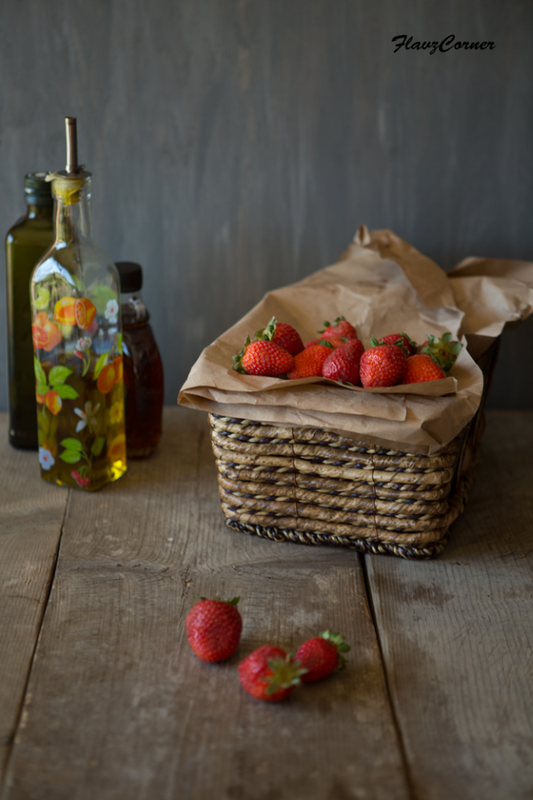 We so often do a simple oil and vinegar one that I just mix when we need it, but you can get more elaborate flavors with a make ahead recipe. Good post -- thanks. Oooo this would be perfect for salads! Pinning so I remember to make when strawberries come back in season! I love trying out new flavour combinations in salad dressings and have never tried a strawberry and basil one before. You definitely can consider I will be recreating the recipe - looks and sounds utterly delicious.